The Full Moon in Aries early this morning (European time) formed a powerful aspect configuration with Uranus, Pluto and centaur-like minor planet Typhon, when the luminaries aligned with Uranus-Typhon opposition. Typhon is a binary scattered disc object discovered in 2002. When the companion, Echidna, was found in 2006, the scientists announced the discovery of the first binary Centaur. In Greek mythology Typhon is a monster who was the source of destructive storm winds and volcanic eruptions. Typhon lived beneath Mount Etna in Sicily. He was a son of Gaia and Tartaros. Typhon was so huge that his head was said to brush the stars. He hurled red-hot rocks at the sky and storms of fire boiled from his mouth. Imagine, how the red fire and rocks shoot hundreds of meters high against the dark night sky! That is what happens when the pressure in the heart of a volcano increases until the crust gives in, and hot lava bursts out. Echidna was Typhon’s grim wife. She has been described as “a nymph who dies not nor grows old all her days.” According to the myth, Typhon and Echidna attacked Zeus, who beat them back and punished Typhon by trapping him under Mount Etna. Echidna and her children were allowed to live as a challenge to future heroes. Scattered disc object Typhon is one of the minor planets that we can associate with weather phenomenon and nature turmoil. At the moment Uranus is in a long on-going opposition aspect to Typhon. The latest opposition took place two weeks ago, the day before the New Moon. In conjunction with Typhon was asteroid Guatemala. At the same time thousands of people were evacuated in Guatemala after the Fuego volcano near Guatemala City started to erupt and spew ash and lava. “It sounded like a pressure cooker that wouldn’t stop,” described one of the locals. 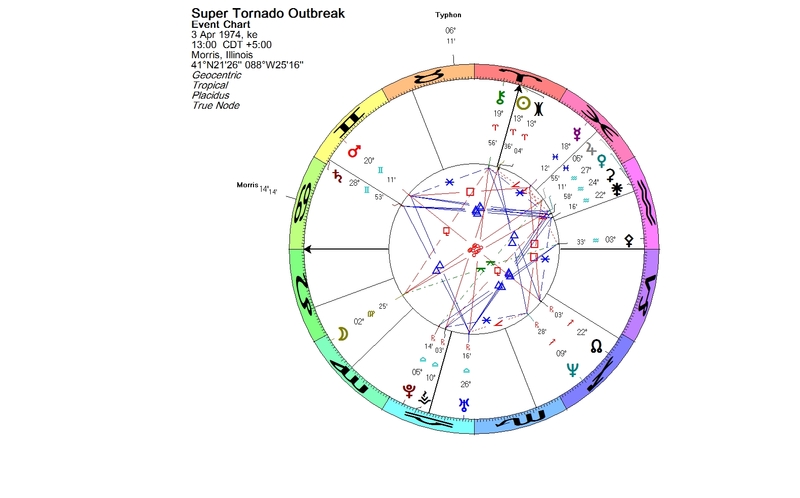 In 1974 the United States suffered a devastating super outbreak of tornados. From April 3 to April 4, 1974, there were 148 tornadoes confirmed in 13 US states. This most violent tornado outbreak ever recorded began in Morris, Illinois. In the astrological chart Jupiter, Pluto and Typhon form a yod pattern. The Sun is in exact conjunction with Eris and forms a strict square to asteroid Morris. Hurricanes form out in the Atlantic and rarely reach Europe. Warming of sea surface temperatures due to emissions of greenhouse gases, is causing a change. In 2005 tropical storm Vince became the first tropical cyclone on record to make landfall on the Iberian peninsula. Vince first developed into a hurricane, but gradually lost strength before hitting land near Faro, the southernmost city in Portugal. The storm brought heavy rain and winds to southern Portugal and Spain. 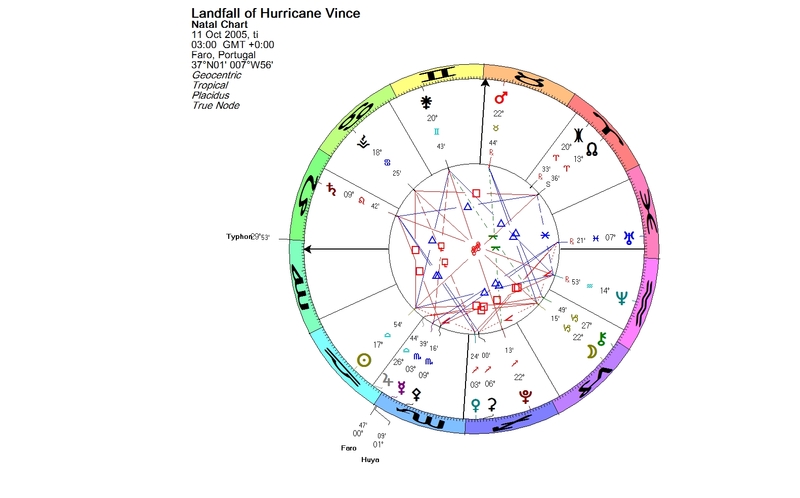 In the astrological chart of the landfall, Typhon is rising in the 12th house. 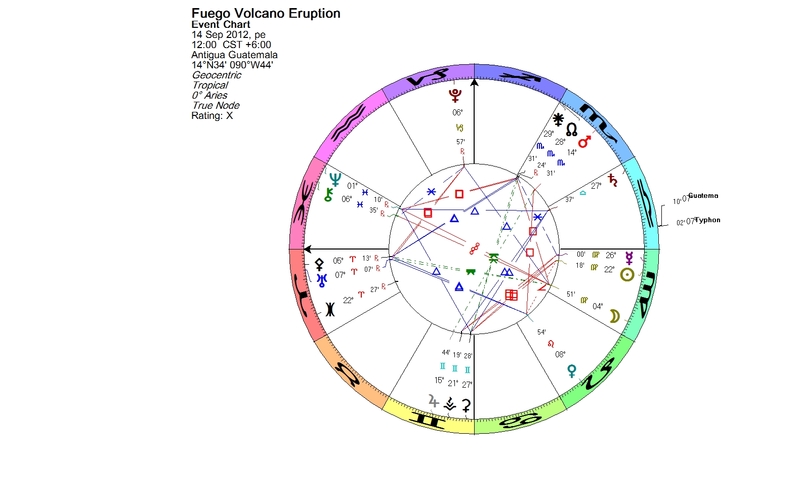 Asteroid Faro is in conjunction with Huya, a plutino named after the rain god of the Wayúu Indians of Venezuela. The name of the mythical monster Typhon is considered to be a possible etymology for the word typhoon. Many tropical storms hit the Philippines every year, but Durian in 2006 was a supertyphoon, and the fourth destructive typhoon in four months, which hit the country. 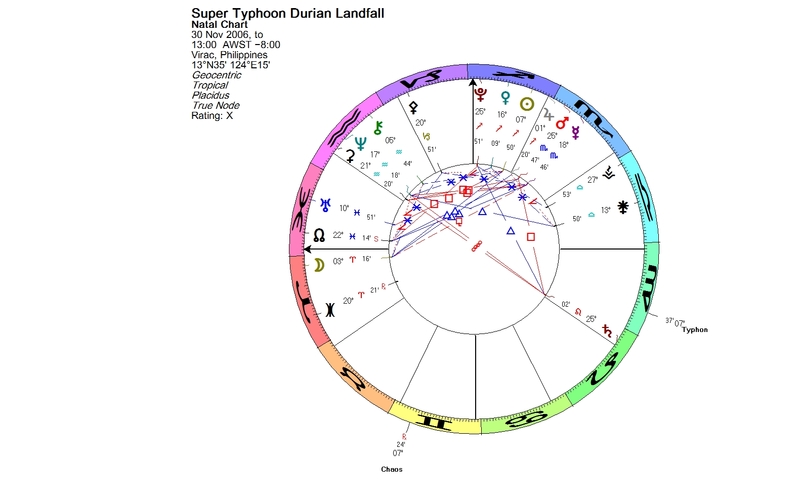 In the landfall chart of Durian, the Sun, Chaos and Typhon form a precise t-square to the degree, and the transiting Typhon is sitting right over Mars of the Philippines. The extreme weather and record-setting temperatures of recent years are evidence for more than just physical global warming. We are part of the Earth. Current trends regarding the crust, oceans and atmosphere of our planet correspond to the inner experience of individuals and humanity as a whole right now. There is no separation. The actual typhoons of the world correspond to the symbolic Typhon beneath the human psyche, growing more fierce with time, demanding attention and action to alleviate ever more severe and widespread damage. The aspect configuration of the Aries Full Moon implies that each of us have a personal responsibility to ourselves and the rest of the world. We are the heroes that were to come. As modern heroes, we are not here to slay monsters. Rather, it falls to us to recover from our fall towards monstrosity through our own efforts. By recognizing and accepting that Typhon and Echidna live within each and all of us, we can embrace and integrate their potential, and create a greater, more sustainable harmony within and without. 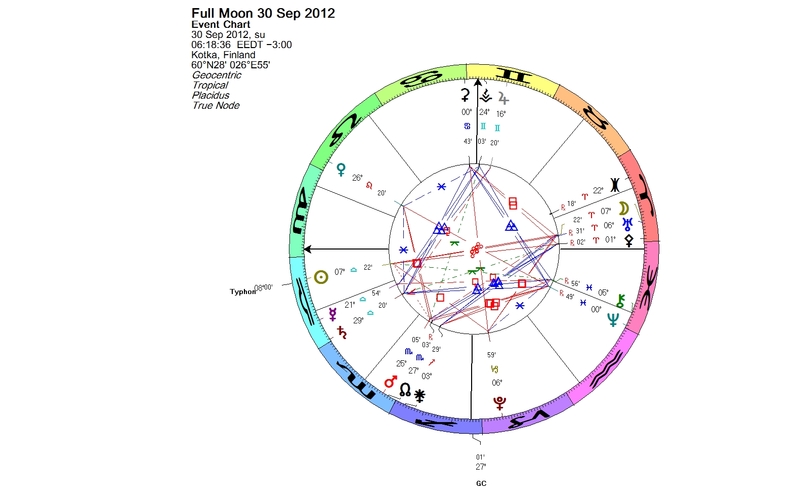 This entry was posted on Monday, October 1st, 2012 at 12:15 am	and is filed under Full Moon. You can follow any responses to this entry through the RSS 2.0 feed. You can leave a response, or trackback from your own site.